Our Airbnb host in Périgueux was a very kind lady who insisted on giving us a tour of the town center. Our apartment was situated on the bank of the River L'Isle. which nestles the town in one of its many sinuous curves. Just a hundred meters away was a preserved 14th century watchtower that perched improbably on a narrow stone base. Périgueux is the largest city in the Dordogne and also its capital. 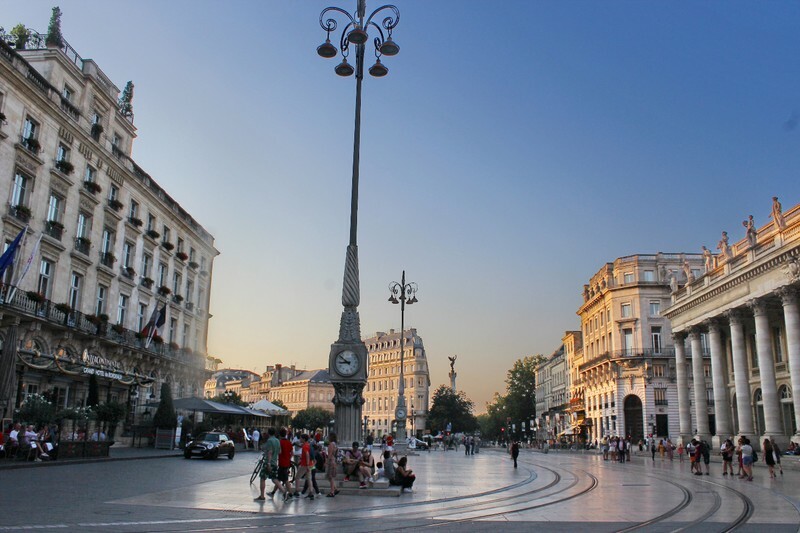 The center was as lively and commercial as Bergerac had been inert. Tables were filling up in the outdoor cafes, and numerous shops were doing a brisk business in local specialties such as foie gras and walnut oil. We weren't in the mood for cafe food, but none of the restaurants we passed were ready to prepare a real meal yet. Eventually we found a gourmet store on a pretty square that had begun serving lunch. It was a little less substantial than what we were craving, but it was enough to launch us into our day's itinerary. Many of the top attractions in the Périgord are clustered around a short segment of the River Dordogne near the cliffside village of La Roque Gageac. We started our exploration of the area at Les Jardins de Marqueyssac. There are several famous gardens in the Dordogne and my research indicated this one would be the most impressive. From the foot of the hill the gardens are perched on, we could see across the valley as far as Château de Beynac and Château de Castelnaud. Both were festooned with banners declaiming "Non au Massacre de la Vallée", a protest against a new road being built in the area. The centerpiece of the gardens were the carefully contoured boxwood shrubs that formed layers of whimsical shapes. The gardens gave way to a park which stretched to the east. From the paths we had gorgeous views of farmhouses along the southern bank of the Dordogne, which was littered with kayaks and small tourist barges. In the middle of the park there was a crafts station and a playground to entertain the children. This provided some welcome relief from their complaints about there being "nothing for kids" that day. At the summit at the eastern end of the gardens was a balcony from which we had an unparalleled view of our next destination, the village of La Roque Gageac. The Dordogne is full of beautiful villages, but La Roque Gageac is one of the most unique. 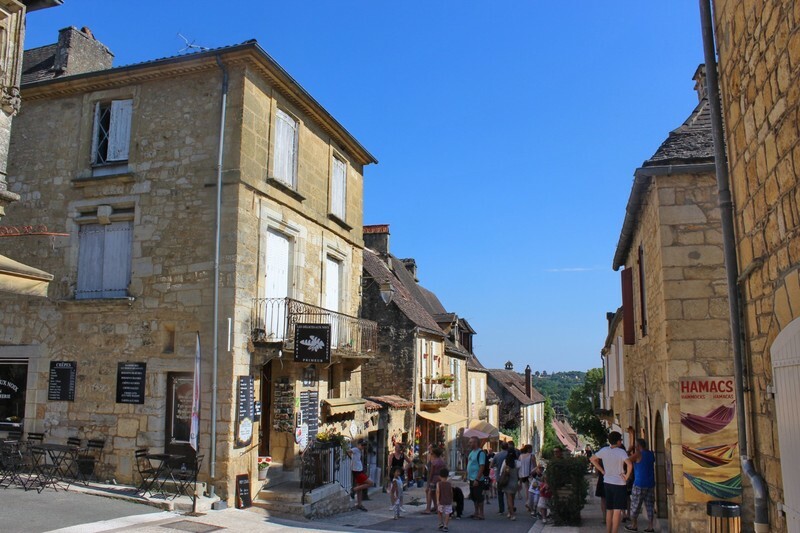 Most of the town consists of a row of similar-appearing stone houses that face the main road through town along the Dordogne. A few more houses are placed along the road that ascends the steep hillside, and behind the hillside is a sheer and formidable cliff. In the upper reaches of the cliff is a medieval fort built within a cave. At the riverside are the companies operating the tour barges, or gabarres. We arrived less than an hour before the last departure of the day so we didn't have time to climb the road up the hill. Instead we ordered some ice cream and let the kids play in the makeshift sprinkler on the town plaza. The boat ride was a little out of character for us but I was determined to get up close and personal with the river that gave the Dordogne region its name. We cruised slowly a few kilometers downstream, passing the Château de la Malartrie at the western end of the town. If your dream is to stay in your very own Dordogne castle, this château is available to rent for about $5000 a week. Further down were campgrounds on the riverbank and rocky beaches with numerous sunbathers and waders. The river was clearly beloved by locals and tourists alike. 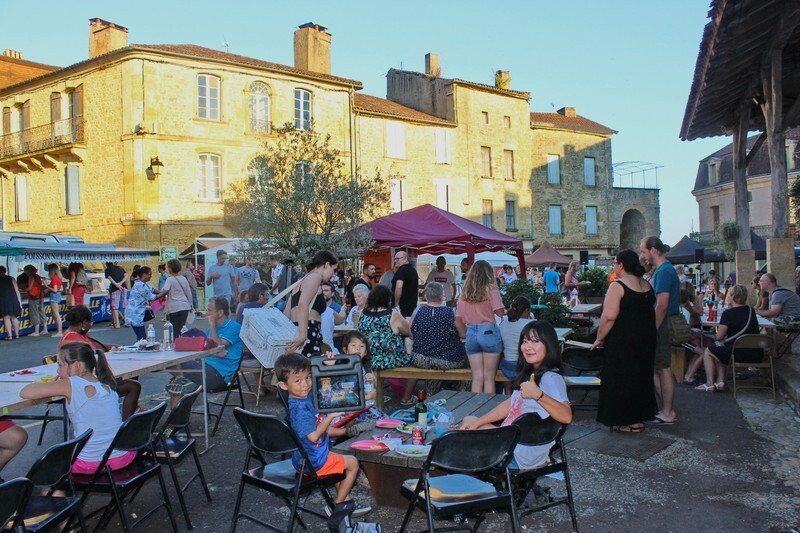 We were behind schedule so I decided we would change the evening's market from the popular one I had chosen previously to the one in Montignac, a village on the way back to Périgueux. Montignac was simply one name from a list of Monday night markets and I hadn't found a single reference to it elsewhere. The car was low on fuel and we stopped at a couple of gas stations around the town of Sarlat. The offices had already closed and the card readers at the pumps wouldn't accept any of my credit cards. 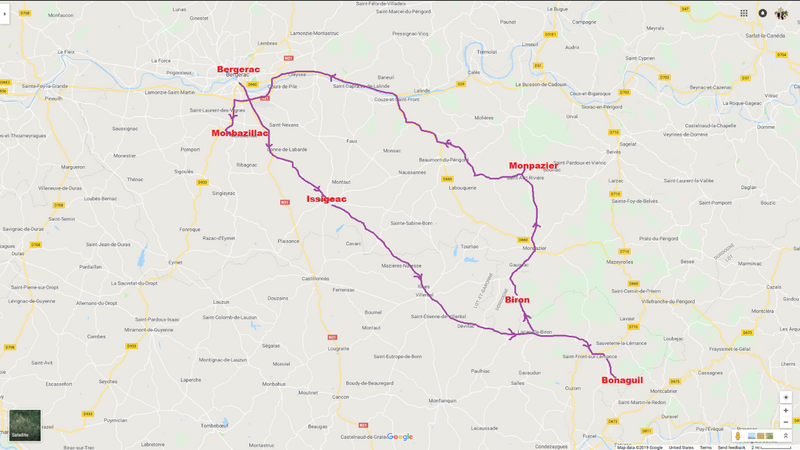 We decided to press onward to Montignac, figuring dinner was the more immediate issue and we would eventually find a gas station where we could refuel. Montignac was spectacular. The small village is bisected by the River Vézère, a branch of the Dordogne. Old-fashioned streetlamps cast a warm glow on the stone buildings as the sun fell. The northern bank upstream from the bridge was lined with outdoor cafes which were filled with patrons. The night market was the best we were to experience. 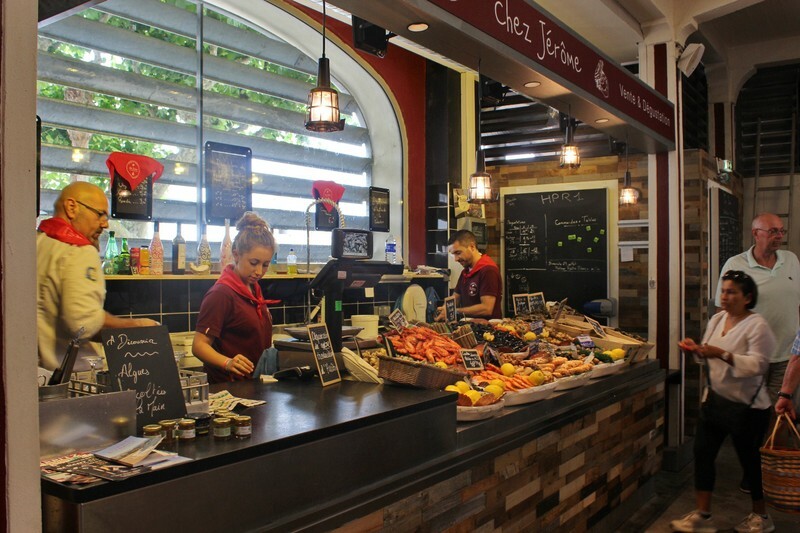 The selection and quality of food was enormous and the vendors were very friendly and attentive. The usual specialties of duck breast, foie gras, and walnut cakes were complemented by an unusual variety of red meats and seafood. The best part was the clientele, who were clearly almost all locals who knew which village to go to for the best food and ambiance. And the language? Nothing but glorious French, all around us. Once we'd emptied our plates for the last time, we danced along with the other early arrivals to a very talented and energetic cover band. It was a jubilant conclusion to a great evening in the Dordogne. During dinner we had put the issue of the gas tank out of our minds, but now that it was pitch dark we had to focus all our attention on solving that problem. Our gauge was telling us we would run dry in 28 kilometers, nowhere near enough to make it back to Périgueux. We found a sizable station just outside of Montignac but the office was once again closed and the pumps wouldn't accept our cards. I saw a man using the station's hose to wash his car and was able to communicate our problem to him, and he advised me that we needed some kind of special card to access the pumps. Could we use his and pay him back in cash? No, he didn't have one. I wondered how he filled up his own car. I saw another car pull up to the pumps adjacent to our own vehicle and raced over. The young driver was already filling his tank when I reached him. We were saved. Could he use his card to fill our tank if I paid him back in cash? I held the bills up, offering a substantial bonus over the cost of the gas. I can't, he answered. This is my mother's car. Ummm ... what? I repeated myself in disbelief, showing him every bill I was offering. He shook his head and hurriedly jumped back in his car and drove off. I had to wonder if it was a common scam in France for a couple to throw their three small kids in a car and head to a petrol station to trick people out of gas money. We waited at the station another half hour but no one else pulled in. We'd been in gas trouble a couple of times before in our travels but this was the worst. We were looking at a serious possibility of spending the night in the station. 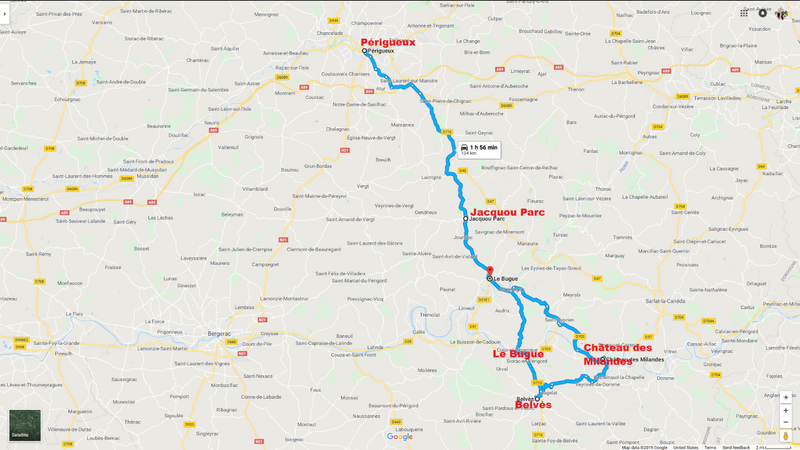 I used the search function on Google Maps and found another station slightly off our route back to Périgueux, 13 kilometers away. That would surely be our last shot with 22 kilometers reading on the gauge. When we got close to the station, my spirits were lifted when I saw it seemed to be a different chain from those we had failed at earlier. The card reader looked completely different as well. I pushed the card in and waited a few breathless seconds until the card was accepted. I've never appreciated the comforting rumble of gas running through a fuel nozzle so much. The kids were all asleep at this point and I looked at their faces through the window of the car. I was astounded that we'd encountered this kind of problem with international credit cards in Western Europe in 2018, but I resolved to be extra careful about our safety and comfort for the rest of the journey. Even in a place like France, it can be very dangerous to become complacent. We got a slow start the next morning and didn't arrive at the weekly market in Le Bugue until nearly eleven in the morning. We found the market exceptionally crowded and also with a preponderance of souvenirs and other merchandise aimed primarily at tourists. We did find one decent seafood stall where we bought some whole cooked crabs and bulots which we consumed at an outdoor cafe (with drinks we purchased there of course). We returned to that same short stretch of the Dordogne we had visited the previous day. 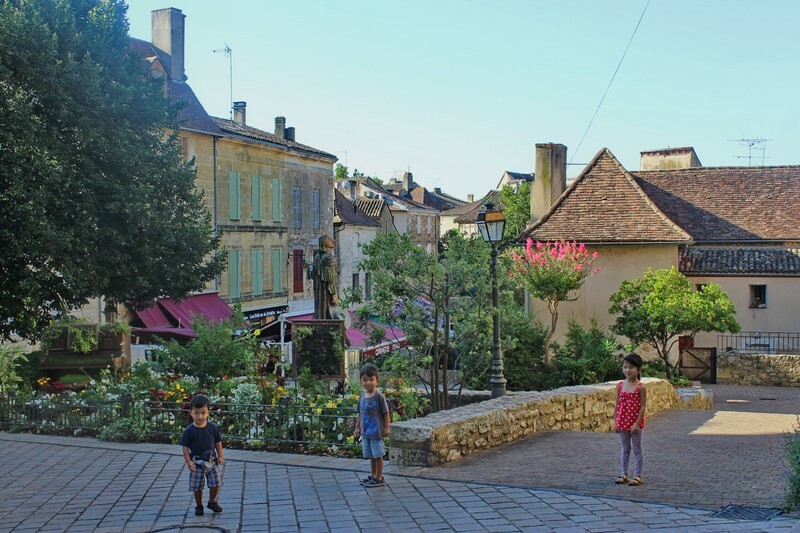 Les Jardins de L'Eau, also known as the Water Gardens of Carsac, was a stop for the kids more than anything else. The water gardens are probably a fairly recent creation to take advantage of the influx of tourists into the Dordogne. However, they've made it a very beautiful place and the kids really enjoyed feeding the koi. If we'd had one less day to explore the area I'm sure this wouldn't have been on the list, but as it was it made for a pleasant hour for everyone. The hilltop village of Domme was just a few minutes from Carsac, on the other side of the Dordogne. The prime attraction is the promenade on the northern side of town with views of the Dordogne valley that are breathtaking and limitless. The town itself was attractive enough but even more saturated with ice cream shops and souvenir stores than Monpazier had been. We didn't stick around for long. 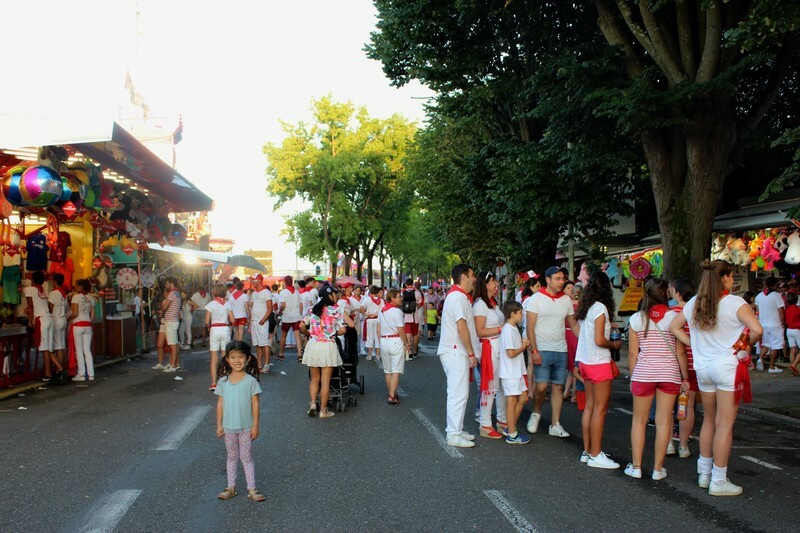 We had perhaps the most renowned city in the Dordogne to squeeze in before that evening's night market. France is a country composed of smaller pieces, each with their own distinct renown. These regions to some extent correspond to the administrative divisions, but also have invisible boundaries that have been shaped by more than a thousand years of history. There's Paris and its surrounds. Provence, of course. Brittany and Normandy. Alsace. The Loire Valley, Bordeaux and Bourgogne. One of the smaller areas to enjoy this legendary status is the Périgord, more widely known outside of France by its departmental name of Dordogne. The Périgord epitomizes everything that is wonderful and unique about France, from the verdant countryside to the iconic towns and castles to the delicious cuisine. We were excited to have four entire days and part of a fifth to work our way through a long list of markets, villages, and historic landmarks. Our previous forays into the Loire Valley and Provence had taught us well that France can't be approached in the same way as Spain. 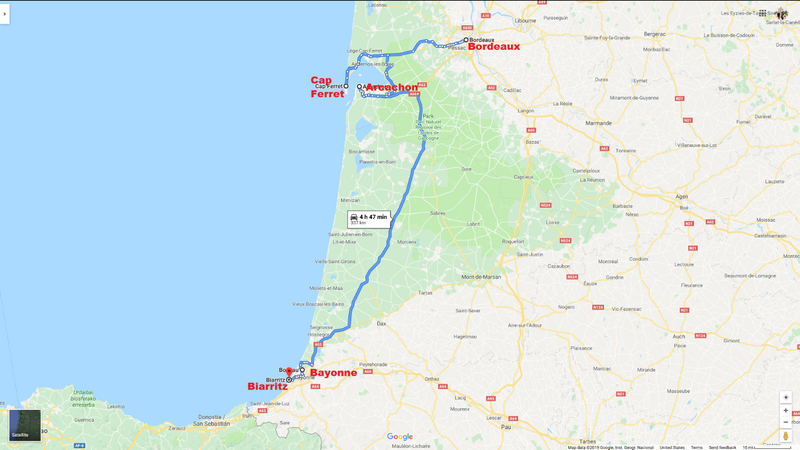 Whereas Spain has less to offer in the early morning and forces travelers into late bedtimes, France is very unforgiving of slow starts. A typical market in the summer has seen its best moments before ten in the morning and is basically over except for the tourist stragglers by noon. 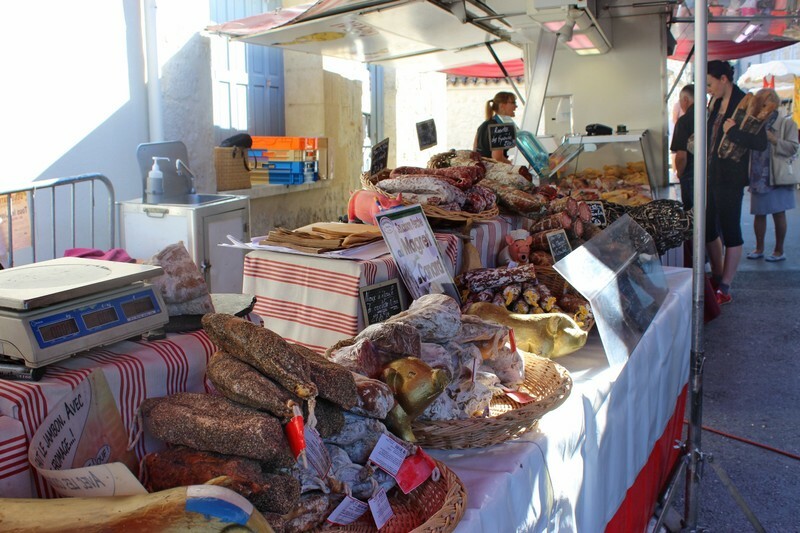 On Sunday morning we set our alarms as early as we could stand and raced a half hour southeast to the weekly market of Issigeac, one of the most heralded in the Périgord. The first thing we saw as we walked into the center was a woman tending a counter with an array of enormous pans, each containing a different tantalizing preparation of meat or seafood. We resisted the temptation to begin eating right away, knowing that every minute that passed would bring larger crowds to impede our progress through the market. Issigeac was a tiny village with narrow streets, stone and half-timbered houses, and the ancient Saint-Félicien Church overlooking the bustling central square. 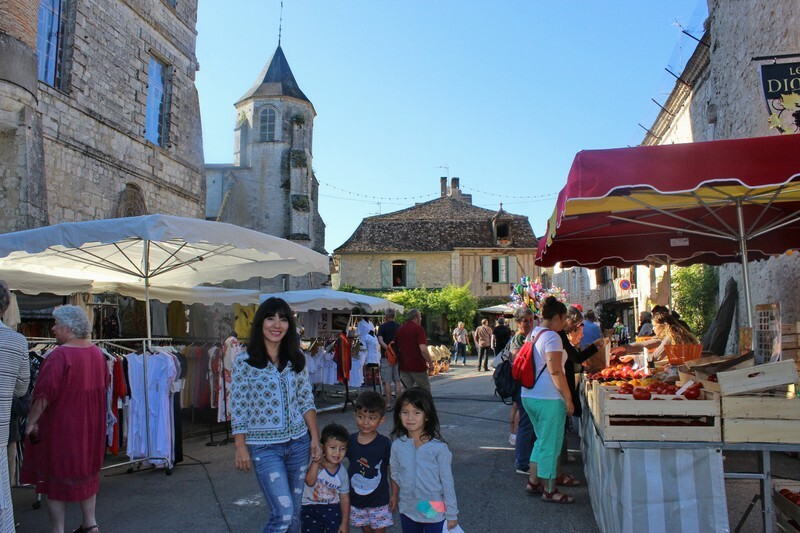 The atmosphere for our first Dordogne market couldn't have been better. After a couple of circuits through the market, we'd selected our bread and cheese, strawberries, freshly-shucked oysters and other delicacies and retired to a park bench to enjoy a messy breakfast. It turned out we'd escaped just in time. We ventured back into the market to let the kids play with the soap bubble guy and found it jam-packed. Arriving early had saved us from having to compete with crowds for the attention of every vendor. We continued southeast to Château de Bonaguil, one of the most picturesque castles in the Périgord. This formidable medieval edifice suddenly appeared at the top of a hill as we approached on the access road, inspiring an immediate rush of traveler's euphoria. A castle on a hill like Bonaguil is really two experiences in one, each with its own distinct pleasures. The first part is the climb up the winding path to the castle past ancient, crumbling stone walls and a carefully restored limestone church. Once we reached the top of the hill it was time for the main event. A stone bridge crossed the crevasse between the hill and the rocky outcropping, or aigeulle, on which the castle is perched. It took a half hour to explore the half-ruined fortress. The crumbling masonry created surreal, Escherian perspectives of the interior elements of the stronghold. We could only imagine the majesty of the castle during its heyday in the 18th century. The views of the Périgord countryside from the tall castle keep were spectacular. We were getting a dramatic introduction to this extraordinary and singular corner of the world, and we were energized to continue onward to the other destinations in our day's itinerary. Our next stop wouldn't have ideally been another castle, but the first sight on the way back from Bonaguil was Château de Biron. Like Bonaguil, this château was a spectacular sight both at a distance from the road and close up. Biron has been preserved and renovated to the extent that the main building can host art exhibitions. By the time we arrived, both the boys were sleeping so I took Cleo for a walk along the side of the enormous castle. I don't think we missed much by skipping a tour of the interior. In the Périgord there are numerous villages that have been clearly designated for tourism. They are featured in every guidebook and they have a support system of cafes and souvenir shops for travelers. Are they truly the most picturesque of all the villages in the region, or simply the ones that prefer the financial boost of tourism to peace and quiet? We weren't going to be staying in the area long enough to uncover all the secret towns that the tour guides haven't discovered, so we followed the crowds to Monpazier. Monpazier was certainly picturesque, a well-preserved bastide that was established in the 13th century in the run-up to the Hundred Years War. On the day of our visit they were having a book festival, and the central square was filled with vendors of old magazines and used books. Much to the kids' enjoyment, a craftsman was demonstrating the historic method of making paper from the pulp of old fabric. We only spent another half hour in Monpazier, enough time to absorb the best examples of medieval architecture and the colorful decoration of the narrow pedestrian streets. In the end it was hard to overcome the feeling of Epcot Syndrome, the term I use for environments that feel more like a theme park pavilion than an authentic travel destination. 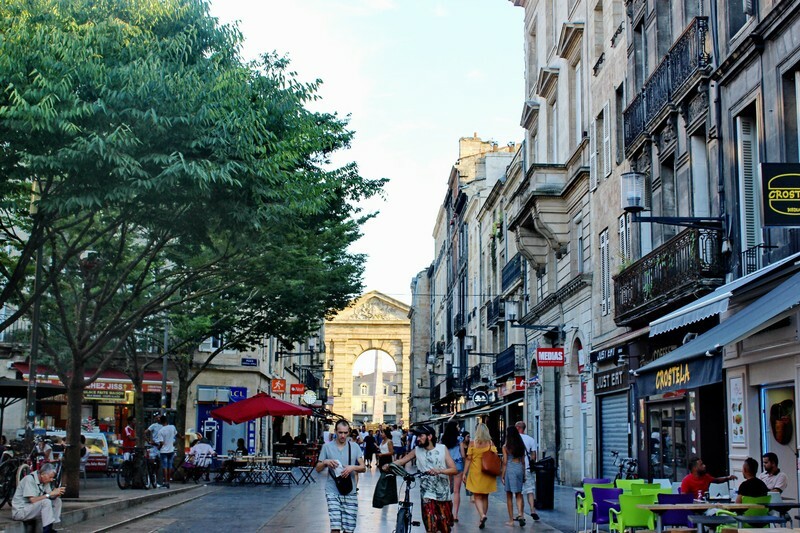 Perhaps the best examples I can think of in France are Aix-en-Provence and the walled city of Carcassonne, but even central Paris suffers from it to some extent. We had skipped lunch in anticipation of an early arrival to our chosen Sunday night market. Monbazillac is a small village just south of Bergerac best known for its château and sweet white wines. On the road approaching the village we encountered a whimsical art installation of colorful bicycles. The roadside market wasn't as picturesque as the one in Audrix, but the selection of food was much larger and the vibe was more local. Whole farm animals roasted on spits and a woman tended to an enormous basin of simmering mussels. We ate reverentially in the shadow of the château. 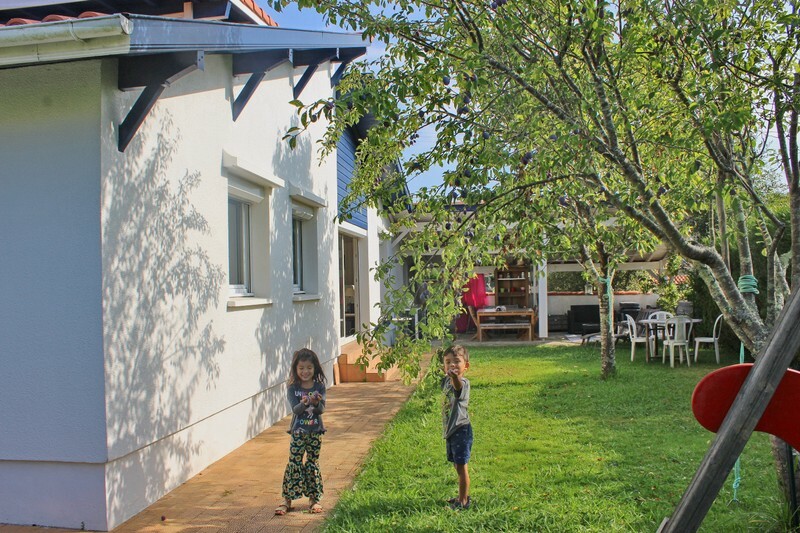 On Monday morning it was already time to leave our first Dordogne Airbnb. 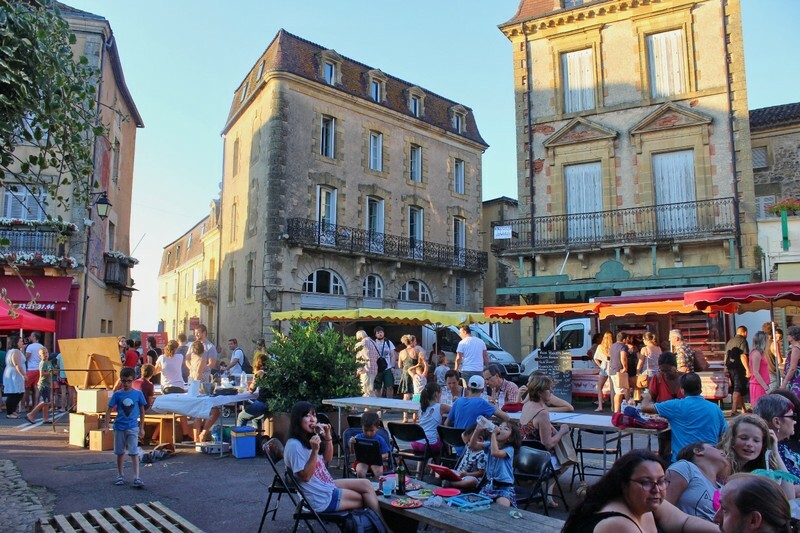 We hoped we could replicate our success with the Pau daily market in Bergerac but it wasn't to be. The market was open in name only, with just a couple of stalls in business and nothing that could be considered a decent breakfast. 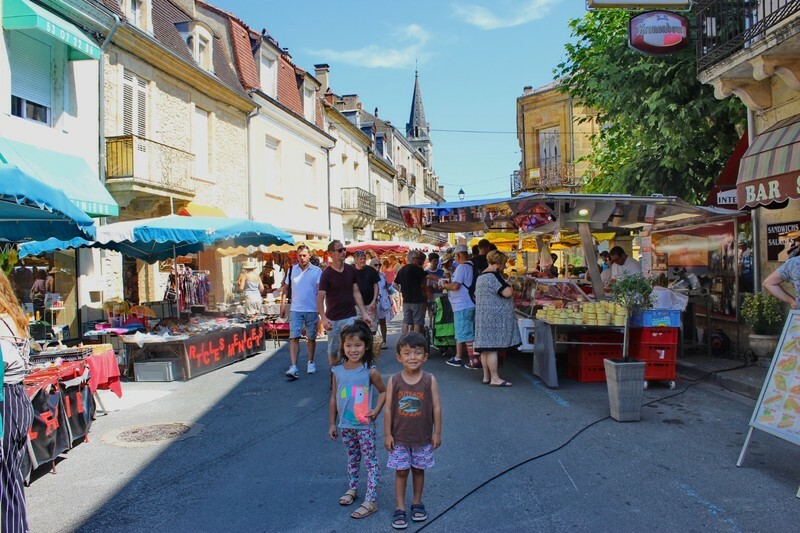 There was no point in trying to make it to a weekly market as we still had to pack, so we walked around the largely deserted center of Bergerac. There were more than the usual number of attractive half-timbered houses and an intriguing little plaza where an upright piano had been converted into a miniature garden. 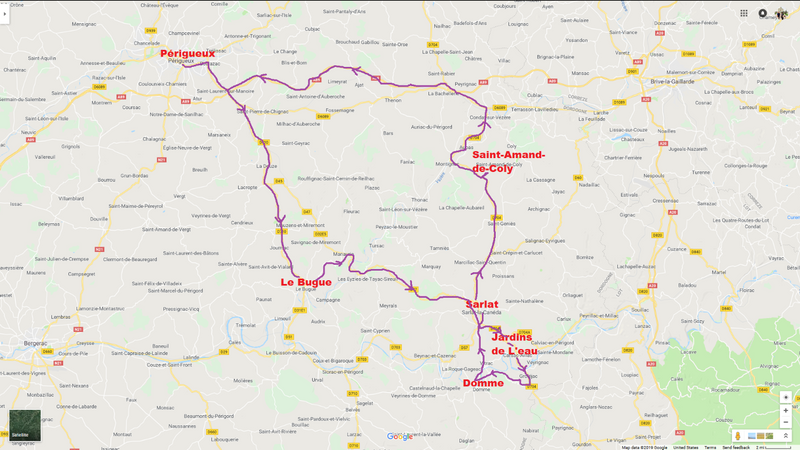 It was still far too early for any restaurants to be open for lunch, so we decided it would be best to head straight to our next Airbnb in Périgueux. Once we were settled there we wouldn't have to worry about rushing back in the evening to meet our host. 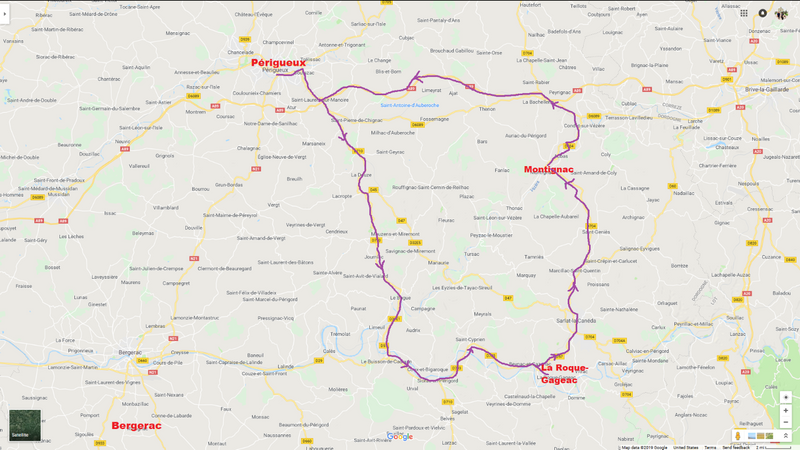 We hadn't even made a dent so far in our list of destinations in the Dordogne.